Occasional snowing in hills or pleasant not so chilly foothills. Behind these delights, a big worry is brewing up for the tea planters in hills as well as Terai and Dooars in foothills. SILIGURI: Occasional snowing in hills or pleasant not so chilly foothills. Behind these delights, a big worry is brewing up for the tea planters in hills as well as Terai and Dooars in foothills. 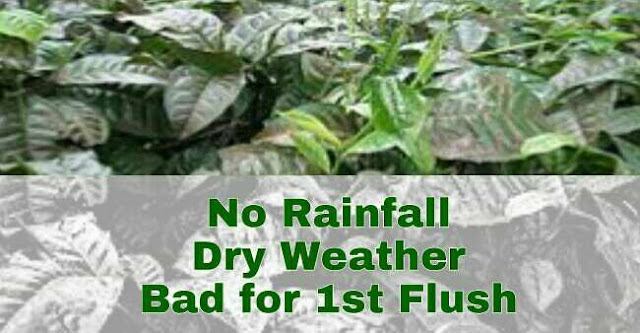 The prevailing weather in the tea belt is feared to significantly hamper quality and quantity of post winter high price ‘First Flush’ tea. During peak winter in December- January, tea plantations undergo major maintenance phase with no plucking of leaves. After this zero yield gap, fresh batch of healthy leaf, known as ‘first flush,’ starts coming in heavy quantity from end February to continue till March end. Quality wise this best quality leaf enjoys highest level of pricing. According to Indian Tea Association statistics, volume wise first flush contributes 20% to this annual production, but accounts for around 35% of value. Naturally, it remains under highest attention of planters. “Weather during this period plays vital role behind quality and quantity of first flush. Tea is a chill loving plant and demands adequate humidity in air or soil. Less than normal humidity or above normal temperature can seriously retard metabolic function of bushes hampering its health rejuvenation,” said veteran Tea Scientist S E Kabir. According to Indian Meteorology department statistics, Sikkim hills has witnessed around 91% lower than long term average post monsoon rainfall till 2nd February. For Sub Himalayan West Bengal, the figure is 86% lower than normal. With that, humidity has also gone 40% lower than average. To make the scenario worse, temperature has gone up significantly. Against a long duration normal minimum and maximum temperature of around 4 degree celsius and 12 degree celsius for the region, actual figures recorded were near 8 and 16 degree celsius. With close proximity and similar topography to Sikkim, Darjeeling is also under almost same weather pattern. “All these put together may put first flush this time under serious jeopardy,” said S. Seal, a senior planter. In addition to that, “Prevailing higher temperature and dry spell may also cause heavy paste and fungal attack in the foothills region,” said Bijoy Gopal Chakroborty, Secretary Confederation o Indian Small Tea Growers Association. However “Things are not yet too bad. A single strong rainfall during next week may alter the situation,” said experts showing ray of hope to the planters.